Mystery Worshipper: Sir Rupert Orangepeel. The church: Christchurch St Lawrence, Railway Square, Sydney, Australia. Denomination: Anglican Church of Australia. The building: It's a sandstone building with a pointy green spire, a new roof and bells. Interesting features inside include a beautiful sanctuary with a tabernacle above the altar, shrines of Our Lord and his mother and a chapel of St Lawrence. During the mass this chapel housed the choir. The cast: The Rector, Rev. Fr. Adrian Stephens, presided and preached. He was assisted by the standard Anglo-Catholic High Mass squad of deacon, sub-deacon, MC, organist and choir. Sung matins followed by procession, blessing of the Crib and midnight mass of Christmas. It was bulging at the seams. Extra seats were placed at the back after the procession. I arrived just after the start of matins, so the greeter whispered a warm welcome and explained the three service booklets. It was a standard pew with cushions for kneeling on. I ached a bit when standing for the motet after kneeling though communion. It's a sublimely beautiful piece of music; why did we stand through it? I arrived during matins, which was chanted by two male choir members and the rector. The church was less then half full at this stage. People arrived in small groups for the following hour. During the space between matins and mass the congregation chatted quietly. It wasn't irreverent and I was still able to pray. According to the booklet, the opening sentence of matins was, "Open our lips, O Lord." Mass began with the choir singing "Silent Night" in German. Three booklets: "Matins of Christmas", "Midnight Mass" and "High Mass". The first contained all of the words and chants for mattins. 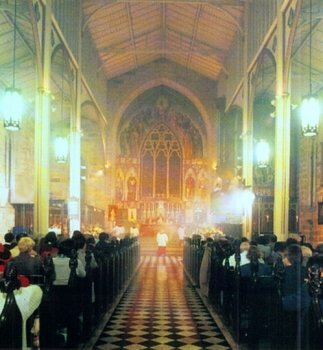 "Midnight Mass" contained all of the hymns and details of the musical items. "High Mass" is Christchurch's standard what-to-do-at-mass guide. An organ and a fantastic choir. Some people have described the CCSL choir as the best parish choir in the English-speaking world. I'm not going to argue. Ritualist worship is generally distracting. How vain is man when he attempts to build towers to God and chase after shadows when the true light has come into the world? However, I couldn't see most of the unimportant parts of the service and could thus focus on the words and the Word. So for most of the service I was far from being distracted. Between matins and mass I dropped a kneeling pad and got some dirty looks. Maybe they thought I was going to be a trouble maker? It was a bit off-putting. Carols were sung during the distribution of communion. There's nothing wrong with this, but I prefer a more "subdued" atmosphere when I receive the sacrament. Bells, smells, copes but no pope. It was about as high as the Diocese of Sydney will permit; so there were no chasubles and communion was celebrated facing the congregation. The sanctuary party marched up and down the aisles with banners and then returned to where they started. 8  Fr. Adrian's sermon was excellent. He began with some humorous and insightful anecdotes. The sermon had a clear structure. He stuck to his point and expressed himself forcefully when needed. This was good stuff. The sermon was short, but the service was quite long enough already. Christmas can be a time when we reflect on and wonder at the Incarnation of God, or it can just be a big birthday party. Receiving Holy Communion on Christmas Day. The singing, both choral and congregational. That sermon. A couple of servers dropped the communion rail, which caused a bit of a break in the high ritual. During his sermon, Fr. Adrian made the odd wisecrack that wasn't really meant to be funny, but some members of the congregation still laughed. It made me scornfully wonder if they'd laugh if he'd asked them to pass the butter. Then I realised that being scornful over something like that shouldn't be part of a Christian life. Thank God for Christ! Who hangs around at 1.30am Christmas morning, particularly after a service that started at 10.30pm? And again, who wants coffee at 1.30am Christmas morning? 3  In case you haven't gathered, this wouldn't be my style. Yes. "For us and for our salvation he.. became truly human." Just one thing among many is an anecdote Fr. Adrian used in his sermon: The council of a regional town organised an annual Christmas procession. The local clergy decided to enter a float. When the clergy rang the council the person they spoke to responded, "What's the church got to do with Christmas?"